In Lawn Forage (work in progress), residents at a handful of homes in Loudoun County, a DC exurb, will volunteer to stop mowing their lawns for a three month period. When lawns are tall and forageable greens abound, neighborhood-wide dinner parties will be hosted in the streets in front of these homes. The meal will include lawn-foraged greens and locally-foraged entrees (venison, mushrooms, etc.). 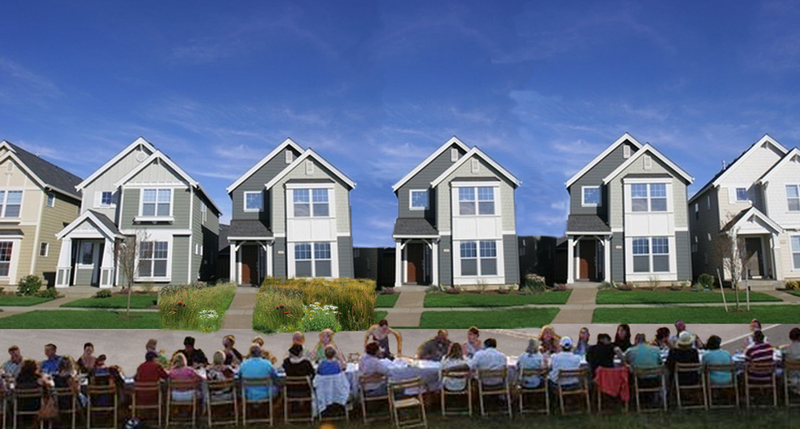 In Lawn Forage, an unkempt lawn (an ecological plus, but a cultural no no) becomes socially acceptable, and a reason to share a meal with neighbors when a street is transformed for dining. Lawn Forage draws attention to ecological and social potential within our suburban communities. Lawn Forage is part of a suburban art initiative called Exurban ReThink, a series of art interventions to influence development patterns in one of America’s fastest growing suburbs – Loudoun County, an exurb of DC. This project utilizes art and information-sharing to help leaders/residents contemplate suburban reinvention, bridging academic research and on-the-ground implementation. Suburbs, home to 69% of Americans, are the largest per capita greenhouse gas contributor. As one of America’s fastest growing suburbs, Loudoun suffers from car-dependency, resource-intensive construction, inequality, and ecological degradation. Yet there is opportunity for bold vision – a suburban built environment that powers itself, cleanses itself, transforms waste, provides wildlife habitat, produces food, deeply satisfies inhabitants, and fosters equality. Exurban Rethink includes three art interventions and a slideshow/discussion forum to reshape this DC exurb’s future development.